Recycled water skis make a fun, sporty display for your favorite vino. 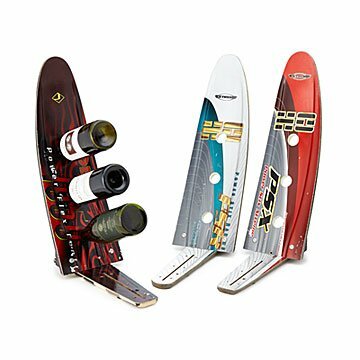 Retired from their days of shredding across lakes and oceans, these water skis have a new favorite activity: holding your wine. Michael Bellino's unique upright holder has three holes to prop your favorite brews or creatively display your best vintages—the natural incline is ideal for maintaining the wine's integrity. Each is slightly weathered from days cruising wakes and catching major air, making it a unique gift for lake and beach loving friends. Handmade by artisans in Massachusetts. Michael Bellino ignored the advice of his ski instructors when they told him "never sit back on your skis." He made his first ski chair from old racing and mogul skis gathered from the ski and bike shop he managed, and still enjoys lounging in that chair at his lake house today. Since creating that prototype, he's expanded his sporting equipment designs, recycling over 20,000 items each year: snow and water skis, wake and snow boards, hockey sticks, baseball bats, and golf clubs.